As children turn the pages of this book, they can use the die-cut holes to guess what Joseph will be making next from his amazing overcoat--while they laugh at the bold, cheerful artwork and learn that you can always make something, even out of nothing. What a lovely day at the fair. Children lining up for pony rides . . . moms and dads in a pie-eating contest . . . babies chasing butterflies . . . babies heading for the trees . . . I SAY! Where are those babies GOING? Only a small boy sees them leaving and follows as the babies chase butterflies in trees, frogs in a bog, even bats in a cave, ignoring pleas to come back. But not to worry, our hero saves the day, making sure that all the babies get home safely from their appealing adventures. Caldecott Medal winner Peggy Rathmann has created a highly original story told in a lilting text and a bold new style with classic black silhouettes against stunning skies of many colors that change and glow as afternoon turns into evening. To celebrate the seventieth anniversary of the Caldecott Medal and another decade of award-winning picture books, noted children's book historian Leonard S. Marcus has updated this absorbing and informative picture of the world's most prestigious illustration award and seven of its acclaimed winners: Robert McCloskey, Marcia Brown, Maurice Sendak, William Steig, Chris Van Allsburg, David Wiesner, and now Mordicai Gerstein. Along with a newly added preface and an introduction that provides a historical perspective on the origins of the award, Marcus takes us into the studios and behind the drawing boards of these seven noteworthy artists, each representing a decade of the award's history. Through personal anecdotes and glimpses of their prize-winning books and works in progress--from doodles to sketches to dummies to finished art--readers will find out how their favorite picture books were imagined and created. The artists reveal their inspirations, work processes, and private reactions to receiving this unparalleled honor. A Caldecott Celebration illuminates the creative process while applauding the talents of the creators themselves. Complete with an up-to-date list of winners, this essential book belongs on the bookshelf of every teacher, parent, child, or book collector who has ever been dazzled by the art of children's book illustration or has aspired to create original work of his or her own. This picture book begins placidly (and familiarly) enough, with three pigs collecting materials and going off to build houses of straw, sticks, and bricks. But the wolf's huffing and puffing blows the first pig right out of the story . . . and into the realm of pure imagination. The transition signals the start of a freewheeling adventure with characteristic David Wiesner effects cinematic flow, astonishing shifts of perspective, and sly humor, as well as episodes of flight. Satisfying both as a story and as an exploration of the nature of story, The Three Pigs takes visual narrative to a new level. Dialogue balloons, text excerpts, and a wide variety of illustration styles guide the reader through a dazzling fantasy universe to the surprising and happy ending. Fans of Tuesday's frogs and Sector 7's clouds will be captivated by old friends the Three Pigs of nursery fame and their companions in a new guise.Once upon a time three pigs built three houses, out of straw, sticks, and bricks. Along came a wolf, who huffed and puffed... So, you think you know the rest? Think again. With David Wiesner at the helm, it's never safe to assume too much. When the wolf approaches the first house, for example, and blows it in, he somehow manages to blow the pig right out of the story frame. The text continues on schedule--"...and ate the pig up"--but the perplexed expression on the wolf's face as he looks in vain for his ham dinner is priceless. One by one, the pigs exit the fairy tale's border and set off on an adventure of their own. Folding a page of their own story into a paper airplane, the pigs fly off to visit other storybooks, rescuing about-to-be-slain dragons and luring the cat and the fiddle out of their nursery rhyme. Officer Buckle puts everyone to sleep with his painfully dull if informative lectures on safety, until he takes on a new partner, Gloria, Napville's new police dog, who knows just how to liven up Officer Buckle's safety speeches. BOMC. Four stories are told simultaneously, with each double-page spread divided into quadrants. The stories do not necessarily take place at the same moment in time, but are they really one story?Black and White is an interesting title for a book that aims to prove there's no such thing as black and white. 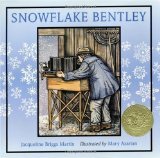 But read on and you will see that irony and playful deception are running themes in this multidimensional, nonlinear picture story, which was awarded the 1991 Caldecott Medal. In it, a normal-looking cow contains a robber literally pointing at one of the plot's various possible outcomes, which remain tentative as long as they are formulated by young readers. Seeing new angles and clues every time they open the book, these readers will probably astound adult onlookers with their excitement and ease at navigating the unknown in a literary medium akin to interactive multimedia.